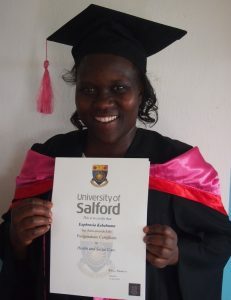 British Commonwealth Fellowships: K4C has hosted over 40 Ugandan Health professionals in the UK between 2013 and 2019. Each of these members of staff from our partner organisations travel to the UK for between 1 and 6 months to complete educational courses, such as diplomas and masters modules, to enhance their knowledge and skills. Each fellowship is supported by the British Commonwealth who provide grants to fund their travel, living and course costs. Sister Euphrasia Kabahuma (pictured left) was awarded the ‘Postgraduate Certificate in Health and Social Care’ by the University of Salford in June 2016. She has now returned to work at Kagote Health Centre in Fort Portal, Uganda, where she maintains a close relationship with K4C and our ongoing projects. Other staff disciplines supported include midwifery, nursing, medicine, biomedical engineering, orthopaedic technicians, record keepers and senior management.